The weather is finally cooling down which brings most of us great relief, however flu season is right around the corner! I just wanted to share a few quick tips with everyone, and I hope you will let me know what you have found to be helpful. 1. Flu vaccines: Flu vaccines are generally considered safe for people with MS, and they are the best way to avoid getting severely ill. The flu virus causes high fevers, which exacerbates MS symptoms, and it's important to avoid it if at all possible. The flu shot is an inactivated vaccine, but the nasal most is a live vaccine so avoid it if you are on immunosuppressants. 2. Wash your hands frequently! Additionally avoid touching your face/nose/mouth without washing your hands first, especially while you are out in public. The viruses that cause the common cold, flu, and stomach flu live on communal surfaces but are easily combated with soap and water. 3. If you do fall victim to a nasty cold talk to your doctor about the best way to keep your fever down, and stay well hydrated! It's the time of year when a lot of people travel, whether it's a day trip or an extended vacation abroad. MS can complicate our travel plans, but luckily Dave of Active MSers is an extremely seasoned traveler and has shared his best tips with the MS community. I highly recommend reading through his recommendations for travel, hotel, and activity arrangements before hitting the road! I've had MS since 2001 and had flare ups usually twice a year. Although I have mild MS with tingling and with flare up moderate pain I've had very good results with taking vitamin D daily. Early in 2011 I had another MRI to determine the growth of lesions because of blurring in my left eye in my last flare up. The blurring went away but I was again asked to consider the MS drugs. Because of the mild MS symtoms I am fortunate to have, I didn't think the risk of the side affects of these drugs was in my best interest. I had read about vitamin D and asked my doctor about it. She gave me a blood test to make sure I didn't already have too much in my system naturally and after that gave me the go ahead. I take one tablet 1000mg daily. I haven't had a flare up since. Almost 3 years! I'm no doctor or researcher but so far so good. Just thought I'd throw that out there for what it's worth. H I have been using a hyperbaric chamber for three months, off and on approximately 30 times. My lower body is improving. I am walking straight and my left leg is not dragging behind me. At seven years old I absolutely knew what I wanted to do with my life: become a performer and maybe head for Broadway! A basement renovation in our home provided enough open space for my first stage, and I loved performing for my family. I'd sing at the top of my lungs and dance my heart out. When I was 18 I entered Syracuse University's musical theatre program with my dream of Broadway still in sight. But when I took classes in ballet and modern dance my coordination was not as strong and precise as it needed to be, and I could not figure out why. At times my head felt clouded, almost like it was filled with cotton. Even though agencies in New York were giving me a chance to audition, I was physically unable to perform. I eventually put my Broadway dreams on hold and moved to Atlanta with my high school sweetheart, Michael. Soon after he proposed, and we started to plan for our wedding and our life together as a married couple. That's when I noticed that my legs were becoming numb and I was experiencing a pins-and-needles sensation in my feet. I had heard people talk about getting cold feet before marriage, but they didn't mean literally, did they? I went to see the doctor and an MRI test confirmed I was living with multiple sclerosis (MS). I was overwhelmed with feelings of fear, panic and denial. How was I going to get through this? In spite of my diagnosis, I kept trying to pretend everything was "normal." I was such a good actress that even Michael, the person closest to me, rarely noticed my efforts to hide problems with my walking and coordination. I didn't talk to anyone about my symptoms because they were too difficult to explain. But with this news I thought my dreams of performing were over forever. A few years later, I had an unexpected opportunity to perform with a local band. The lyrics talked about doing what makes you happy, and following your dreams no matter how many challenges you face. I fought my fears and sang like I had nothing to lose, and the feeling was amazing. It was the push I needed to re-ignite my passion for music. I went on to record my first album, "Believe." I also wrote and directed a short film, "The Show Must Go On," to help others understand what it is like to live with MS. I found that when my heart was opened once again by my love for music, it freed my mind as well. I was less afraid — and more focused on what I could do. I realized that denial was holding me back and decided to educate myself about MS. I saw how much I could still accomplish. Instead of avoiding my doctor, I started to listen to him about treatment options that could help me protect my health. I also got more involved with MS organizations. Most importantly, I found the confidence to conquer my biggest dream of all: becoming a mom. Michael and I now have a son, Kingston, and a daughter, Giabella. I wrote "Dreams: My Journey with Multiple Sclerosis" to encourage people living with this disease to use their passion to overcome denial and help others understand the impact of MS. I hope that this story will help others on their journey with MS. Download a free copy today for you or someone you know who needs help getting started on their dreams at www.DreamsTheEbook.com . 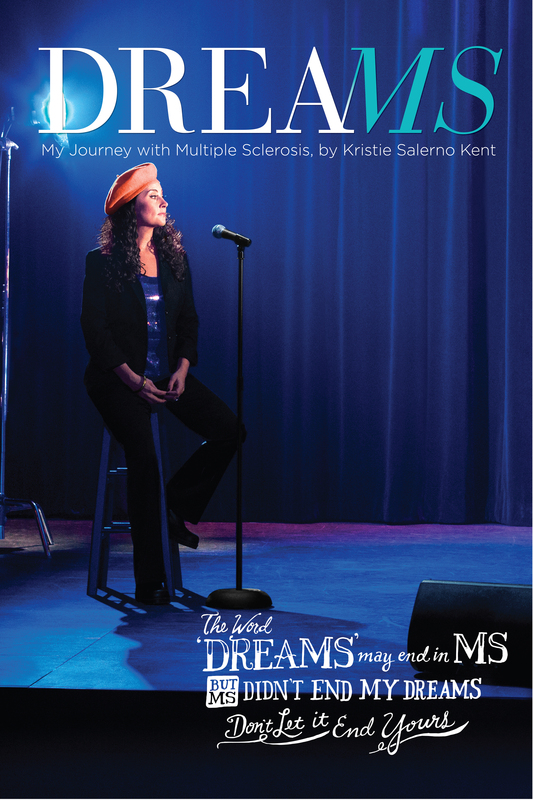 Kristie Salerno Kent, a multiple sclerosis patient advocate, singer and songwriter, award-winning filmmaker and mother of two has just released her first book, "Dreams: My Journey with Multiple Sclerosis." A free download is available at www.DreamsTheEbook.com. Kristie is a paid spokesperson for Acorda TherapeuticsÂ®, Inc.
"I am NOT the DIsease"
I am NOT MS. It doesn't determine if I smile or laugh. I have a medical condition. In life we all face obstacles. there are always challenges. Where there are challenges, there are opportunities. I may not remember everything or even multitask as flawlessly as I use to, but maybe that means I should pay more attention to organization. Post stickers, use digital reminders. I am fortunate to live in a world with technology. i think this desease has progressed faster than it should because of additional stress. STRESS THAT I FOSTERED. Stress can kill the healthiest of persons so why should I aid this medical condition to progress. Solution; RID STRESSORs ; RELAX; BREATHE; TAKE CARE OF ME!! Eliminate those that try to bring me down, who does not support me. Embrace life!! Take it easy and enjoy. Let this condition remind you to enjoy, live and love as much as you can. And maybe all that love and joy inside will reverse or greatly slow the progression. I was first diagnosed in 1984 (before diffinitive techniques were really available) complete numbnes from arm pits down! and also no feeling in my hands (arms yeshands no!) Did not believe diagnosis and sought help through alternative medicine. Ended up at a chiropractor who after 2 weeks of daily treatment was able to get me walking again again and back to normal after about 6 weeks. ......went on with life (as I too had small children to raise ) and did not have another REAL flre up until 1998 where everything on the entier left side went numb. By then they had MRI's EEG's, spinal taps etc and came the "most probable cause is MS diagnosis. I was lucky enough at the time to have a neuro who listened to my concerns about starting on a medication (Betaserone, Copaxone, or Avonex where the choices of then and now pretty much). She said it was MY decision to make and if alternative therapy was what "I" chose to do then she would still treat me even though I did not chose to do the drugs. Back I went to the chiro and (it took 6 months of intensive treatment almost daily but I once again was back to 95% of my original self. Fast forward to Sept 2011....another major relapse (into a wheelchair much of the time) and I am scared, scared, scared.....even though I have fundamental belief that the "disease modifying drugs" will ultimately do more hard (i.e liver, kidney heart damage etc) I am desperate to feel better. I had after 3 months worked my way out of the wheelchair, off the walker, and onto a cane which mainly was for if I needed to travel outside the home. With my can I had worked my way up to a mile each day and was feeling proud of my progress........then came the nurse to show me how to do the Copaxone injection and my first dose. As anyone who has taken this drug knows it will make you flush and very warm feeling and leave a large lump at the injection site, but I was willing to deal with those things for this drug that was supposed to make it so my exasterbations would be "less". Well with in 3 days of injections I lost 2 months of physical therapy that I had achieved! I could no longer NOT walk a mile with a cane....I could NOT even make it across a room without one! It took me another 2 months to get almost back to where I was BEFORE I took their wonder drug.....so PLEASE do NOT let some DR who has never had the experience of MS bully you into doing something that you do not want to. check out some info on DR. Terry Wahls from Iowa City IA. This DR ACTUALLY HAS MS and a sever case and has gone from a wheelchair to riding her bike to work 5 miles each day and has done it with changing her DIET. I was told about her by a nurse at the hospital and am following her diet advice and I am back to walking without a cane for up to 2 miles and do not have to stop each day and take a nap for 3 hours just to make it through the rest of the day! Please understand I am in NO WAY CURED and do not want to make that representation but this diet is healthy and I KNOW it is NOT doing damage to my other organs while it helps me. You should also be able to find many videos on youtube about her. God Bless you and I hope you find the help you need. FYI Lyme disease has almost mirror ymptoms to MS and can be diagnosed with a simple blood test and CURED with anti-bioitics especially if caught early enough. If you live by a grassy area (as most of us do) and go out for walks on a regular basis i would MAKE sure that they ALSO do the test for lyme disease. I do not know what the reasoning behind it not being a standard test when people such as ourselves come in with symptoms....but you will have to INSIST probably that they at least RULE it out as a possibility of your illness. Has anyone ever included bee pollen with their diet? I also take niacin. Bee pollen seems to have help me with the fatigue factor along with the pins and needle effects... I haven't had any issues really in months aand live in florida. Although I'm lucky and when I get flair-ups in a sense., I'm fatugued bad of sorts., not what the usual flair up is from what I've been told.